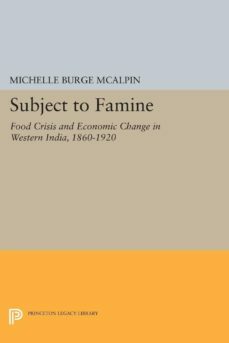 Michelle McAlpin moves beyond the concerns of previous studies of famine (most of which focus on governmental procedures designed to alleviate it) and examines hitherto neglected problems, such as the quantitative evaluation of food grain shortages, the nature and extent of popular insurance mechanisms in famine-afflicted areas, and the effects of famine on population growth and on long-range economic performance.Originally published in 1983.The Princeton Legacy Library uses the latest print-on-demand technology to again make available previously out-of-print books from the distinguished backlist of Princeton University Press. These paperback editions preserve the original texts of these important books while presenting them in durable paperback editions. The goal of the Princeton Legacy Library is to vastly increase access to the rich scholarly heritage found in the thousands of books published by Princeton University Press since its founding in 1905.